All believers are called to worship. But some are anointed to bring others into the presence of God. Jide Adeoye (pronounced GEE-day Ah-deh-OH-yay) has been gifted to usher in the Holy Spirit using the vehicle of music. 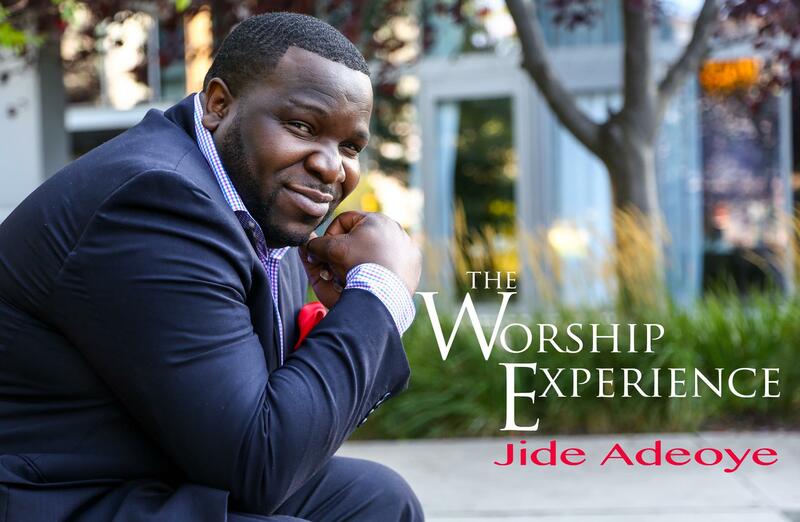 Merging the musical styles of Contemporary Christian Music, Praise and Worship and Contemporary Gospel Music, Jide has created his own unique style of musical adoration. The native Nigerian and current Canadian resident is a praise and worship leader blessed to share the stage with artists such as Don Moen, VaShawn Mitchell, Lionel Peterson, Sonnie Badu and William McDowell. The world was introduced to his music ministry in 2014 when he released his debut praise and worship record, The Worship Experience, a collection of powerful love songs to the Lord. His project and talents caught the attention of the Gospel music industry and it netted the artist 2017 VOGMA Award for Best Praise And Worship Leader Of The Year, 2017 African Entertainment Awards Canada Best Gospel Artist, and 2015 Nominee for GMA Canada’s Covenant Award for Gospel Album of the Year. It’s just the beginning of a ministry that’s destined to take this young man around the world singing the praises of God. Born in Ile-Ife Nigeria, Jide Adeoye started singing at the tender age of 6; he was the youngest of 3 children. With ministers in his family, Jide always had an example before him of what kingdom service was all about. Music was heard in his home as well and he joined his first choir at the age of 13 when he attended Solid Foundation Camp, a Christian youth summer camp in Lagos. He spent 16 years in Nigeria, stayed in the United Kingdom for a while and eventually moved to Mississauga, Canada with his family in the early 2000s. He completed his college education at the renowned University of Toronto where he studied Economics and Political Science. Ministry and music was never far from his thoughts, however; he joined the House of Praise in 2002 and three years later he became part of the Perfected Praise Voices Choir. There his relationship with God was strengthened and his love for music, passion for worship and desire for God’s presence was further awakened. Also in 2005, he felt the call to preach and pursued that calling in addition to ministry through music. His official debut into the Gospel music industry is a powerful one. Produced by Stephen Lewis (who also steps in as principal songwriter), The Worship Experience is aptly named. From one spirit-filled track to another, the live CD and DVD provide believers an opportunity to lift their Savior high. Praisers will enjoy the heartfelt delivery of tracks like the spirited opening track, “This Is The Day” and “Days of Elijah/How Great Is Our God”. “True Love” is a beautiful inspirational song as is the uplifting “God Great God”. Exhorting the Lord throughout and inviting the congregation to do the same, Jide makes it clear from beginning to end that it’s all about the Lord, especially during the song, “When I Think About The Lord”. Other highlights are songs like “Only You”, “You’re All I Need” and “You Are Worthy To Be Glorified”. In addition to his album, Jide released a single in the summer of 2016 titled 'This Is The Day Remix' which is a remake of the hit song 'This Is The Day' From The Worship Experience Album. Also, just recently he released a new single in November 2017 ‘’Excellent Remix’’ is a remix of "Excellent" from The Worship Experience Album. This song is based on Ps 8:9, "O Lord our Lord, how excellent is thy name in all the earth!". His passion for worship is clear throughout each and every song. “I believe that pure worship is missing from the church today,” says Jide. “We’re to worship God in spirit and in truth – without baggage. We can’t bring anything with us when we’re truly worshipping God. He is looking for pure and uninhibited worshippers. That’s the reason the album is named, The Worship Experience. God wants us to let go of everything when we come into His presence,” says Jide. Throughout the years, Jide has grown into a dynamic praise and worship leader known for his deep worship and signature sound. His desire for all people to know God on a deeper level drives his style of energetic praise and soulful worship. Jide is married to Ovalyn and has two children. He is determined to ensure that all believers have a worship experience.